Do you not have enough time to go abroad and do a classic language stay over a many weeks? Do you not particularly like the idea of studying French in a class room? Do you love the French culture, the diversity and the beauty of our regions, as well as our culinary specialities? FrenchToGo is made for you! With FrenchToGo, you have the opportunity to visit one of the most beautiful cities in France whilst improving your French during a “walk and talk” program. Minimum 2 persons to book the course. How does a FrenchToGo weekend work? You have the choice of 4 French cities: Bordeaux, Lyon, Montpellier or Nice. Our FrenchToGo program takes place every weekend. It starts at 2pm on Friday and finishes at 12 midday on Sunday. 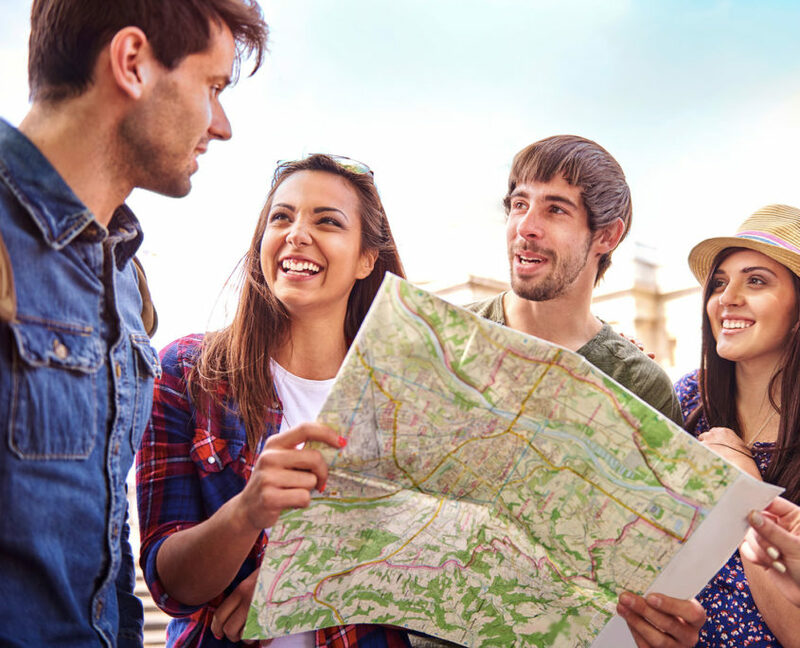 During your weekend in Bordeaux, Lyon, Montpellier or Nice, your teacher will help you discover not only the little secrets of the French language, but also the culture, history and gastronomy of their city. In order to make this experience completely unique and to give you the chance of practising your French in the best possible conditions, we have limited the number of participants to 10 participants per session. If a date works for you, don’t wait and book immediately. In Nice, you will be able to enjoy our unique micro-climate, with 300 days of sun per year and a typical atmosphere for the culture of the South of France. During your weekend in Nice, you will appreciate an unusual visit to the old-town and learn all of its secrets. Then, you will climb the Colline du Château for a breathtaking view of the Baie des Anges. You will also taste our local specialities, take a boat to discover a different view of the town and finally dine with your teacher by the sea in the typical village of Villefranche-sur-mer. All of these activities are guided by your teacher in French. Lyon is the first destination for a city break in Europe and that is not for nothing! Emblematic city of French gastronomy, Lyon is home to the greatest chefs. During your FrenchToGo stay in Lyon, you will benefit, among other things, from an usual visit to the town, a wander through nature at the Park of the Tête d’Or and of course, a lunch in the unavoidable “Bouchon” Lyonnais to discover the local cuisine. Bordeaux is undoubtedly the world’s capital of wine. But this jewel of the 1800s is also classed as a UNESCO World Heritage site. During your stay in Bordeaux you will benefit, among other things, from an usual visit around the town, you will discover the secrets of oenology and of this wine region by visiting la Cité du Vin. Then you will be able to take advantage of a tasting of the Bordeaux and of a traditional meal on a barge. Montpellier is both a dynamic city with a boundless student life, but also an ancient city with magnificent monuments. During your stay in Montpellier, you will be able to discover the old-town, le Milvé as well as the Arc de Triomphe. Then, you will visit the Château de Flaugergues to taste some regional wines and culinary specialities in a restaurant of original decor.